So it's been a good seven days since the last blog update. I feel really bad about that, but then I was on a cruise for at least four of them — so, I don't feel that bad. But I do have a bunch of updates to get through now — dealing with all three NHL teams whose names start with "P." Total coincidence! 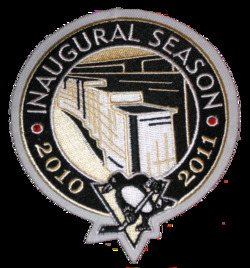 Pens' new commemorative patchOver the weekend, the Pittsburgh Penguins started selling a new jersey patch that commemorates the inaugural season of the team's new arena. Season ticket holders got their first look at the patch and the new CONSOL Energy Center at an open house event this past Saturday. I don't have any information as to whether the patch will be worn on the uniforms, but why wouldn't they be? If you're wondering what that might look like, Steve Z. has been kind enough to share a photo. Though my guess is we'll see it on the front rather than the shoulder, if it's used on the sweater at all. Also special thanks to Jeff S. for the above photo of the patch itself. Got lots of emails about this while I was gone. Thanks to all of you! And if you're in Pittsburgh and dying to see the new building for yourself, here's a useful link. Panthers Mulling a Reduction of Red? Miami Herald writer and Florida Panthers blogger George Richards posted an article on Monday mulling the possibility that the team may drop the red, not this season, but the next. Word on the street is the Panthers are likely going to keep the leaping Panther as their primary logo in 2011-12 while changing the team's colors from the H. Wayne picked blue-gold-red to the Tampa Bay Rays scheme we saw last year. The blue-on-blue color scheme (what do we call it? The JetBlues? The Sunrise Rays?) apparently will be the Panthers uniform look by that season. In 2011-12, the current thirds would become the home jersey with a new white/blue/light blue coming for the road. The third jersey — if the stick breaking panther is indeed the primary logo — could incorporate the head crest. If there is a third jersey. Probably won't [be] for the first few years of the redesign. There's a lot more to the article, very much worth reading, but I don't want to copy it all here. Richards does say that he has yet to confirm these "plans" with team brass and that the stick-biting panther is the "logo of the future." Meanwhile, the team's official website was recently redesigned to highlight the two-tone blue and gold color scheme. Red is still a key accent color, but it does appear the Cats are headed in a new direction with their marketing efforts. We'll keep an eye on all this. Related: Panthers Reworking Primary Logo? Taking bets now. Which logo will the Predators use this fall? In the spring, it was all but confirmed by Reebok that the Nashville Predators would have new home and road jerseys for the 2010-11 season. The assumption being that the Preds would give the spotlight to their third jersey — along with a white version of it. Lately, we've heard lots of reports from Nashville-area hockey retailers that nothing is changing with regard to the Predators uniforms. But at the same time, notice the redesign of the team's website to accentuate the dark blue and silver — the colors of the logo on the alternate sweater. New Logo on Social LinksCheck out the graphics they use to link fans to their Twitter and Facebook pages right there on the home page! Where's the orange and gold? Gone, that's where! I know it's getting late in the summer, but the Sabres are waiting until the start of the preseason before they give up their new look. Who's to say the Predators aren't doing the same? — just much more quietly. 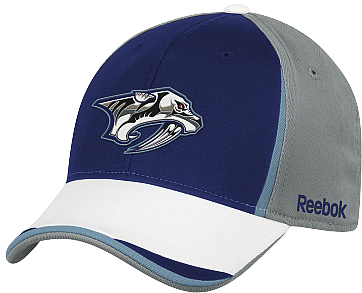 In fact, if you remember back to the draft a couple months ago, the Predators only handed out hats with the recolored primary logo. Then again, they've still been handing out the current jerseys all summer. When Shea Weber was announced as captain, he got one. As did the club's new bosses just last week. So I don't know. It seems like an obvious choice, but we'll really just have to wait and see. The suspense is just killing you, I know.